In Competence by Design (CBD), competency involves more than ‘know how’. It requires that trainees also ‘show how’ and demonstrate the ability to ‘do’ independently. While learning is often associated with teaching, there is also high value in using assessment as a learning tool. 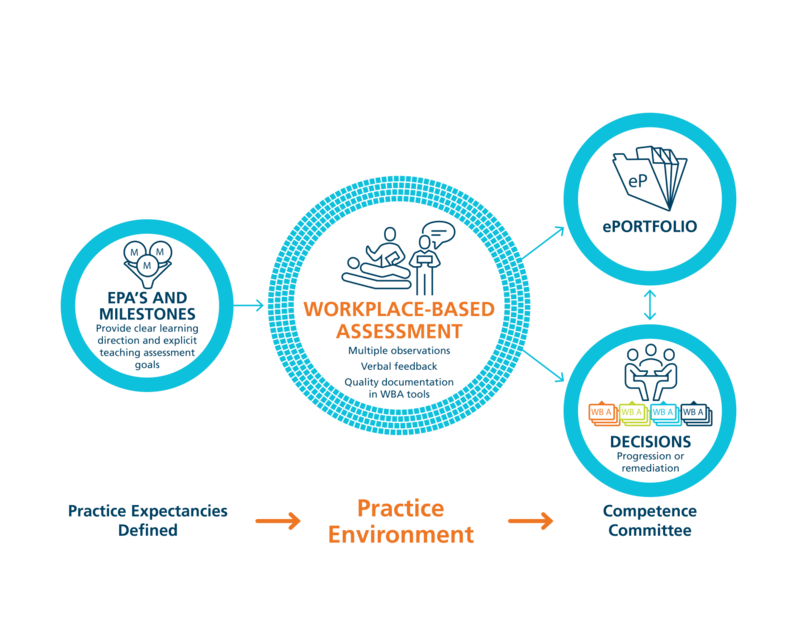 Workplace-based assessment (WBA) maintains this formative focus by having frontline clinical teachers observe and document authentic observations in the workplace on a regular basis. The results of individual observations are shared with trainees in a way that guides learning improvement. When these individual workplace-based assessments are aggregated over time, the data from multiple observations and multiple sources gives a clearer picture about a trainee’s performance and progress. Are you involved in the roll-out of CBD? 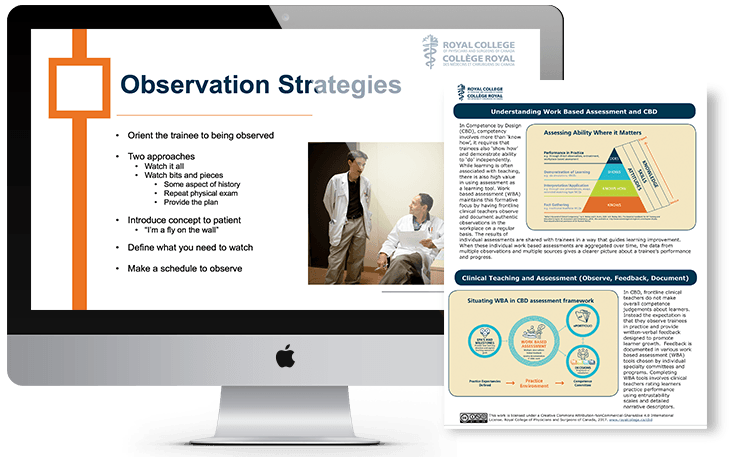 Save time with these new resources from the Royal College that support workplace-based assessment! In CBD, frontline clinical teachers do not make judgements about learners. Instead the expectation is that they observe trainees in practice and provide written-verbal feedback designed to promote learner growth (i.e. “coaching feedback”). Frequent and timely coaching conversations between a learner and observer are a critical element of WBA. This is known as Coaching in the Moment and it follows the RX-OCD step-by-step process: Rapport, EXpectations, Observe, Conversation, Document. Feedback is documented in various workplace-based assessment (WBA) tools chosen by individual specialty committees and programs. Completing WBA tools involves clinical teachers rating learners practice performance using entrustability scales and detailed narrative descriptors. 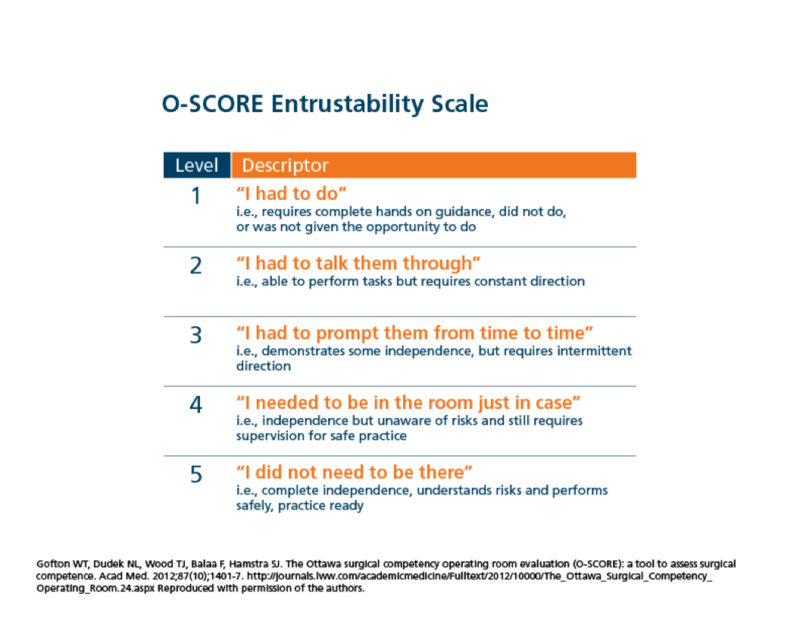 What is an entrustability scale? These scales use entrustment anchors to rate a trainee’s ability to safely and independently perform practice activities indicative of EPA achievement. Entrustment anchors align well with expert observer performance judgements and are shown to be highly reliable compared to traditional WBA rating scale anchors. The following entrustability scale is incorporated within several WBA tools endorsed by The Royal College. Want to learn more about how to apply the entrustability scale? The Entrustability Scales module is a self-paced online activity that is designed to help you practice differentiating between the 5 levels of the scale and applying the scale to your own specialty. Click here to open the module: Entrustability Scales: WBA Rating Anchors to Trust. One goal of WBA is to collect as much information as possible about a learner, from as many sources as possible. Over time this data is pooled together to create a comprehensive image of the learner’s competence and help inform competence committee discussions about resident promotion. By shifting these broader promotion discussions to the competence committee, interactions between individual learners and observers can focus on coaching feedback designed to help improve learners’ performance. Narrative comments focused on behavior specifics are the most valuable information in any WBA tool. Good comments provide trainees with detailed guidance for improvement and competence committees with rich context for the performance ratings. Isolated practice activities are linked to, but not inclusive determinants of EPA achievement (e.g. performing a knee exam is only one part of the osteoarthritis management EPA). WBA tools provide performance rating information and feedback specific to only that activity and context. As an observer, you are not deciding a trainee’s overall competence moving forward. Trainee progression decisions are informed by multiple observations using an entrustability scale.